Veronica Mars is on the case again when she is hired by the insurance company of the illustrious Neptune Grand hotel. A staff member is accused of assaulting a young woman and leaving her for dead. No one can find the man who is accused of the crime, the victim's memory is spotty to say the least, and she refuses to say who she was meeting the night of her attack. Veronica is determined to find justice for this woman, even if no one believes her story and finding the answers could strain Veronica's relationships and put her life in danger. I found the case itself more compelling in this book than I did in the first VM story. Without giving too much away, the mystery in the first book felt more like adding a new dimension to Veronica's life and story and not so much about an actual case. While I appreciated the character development the first time around, the mystery in Mr. Kiss and Tell is realistic and frustrating and takes a long time to solve and even longer to prove. Authors Rob Thomas and Jennifer Graham are also creating storylines that can stretch through the series. As Mars Investigations takes smaller cases and Veronica works her current case, her father Keith is also trying to discover who tried to kill him (during the VM movie) and uncover just how deep corruption goes at the Neptune Sheriff's Office. They continue to develop the class disparities between the wealthy and those who are barely making ends meet, which were evident in the show and really expanded during the movie and the first book. Reading about these beloved characters is wonderful and Thomas gives his readers some benefit of the doubt this time around. He doesn't explain relationships and history as much as he did in the first book. This makes the introduction of a new character or two all the more exciting for fans who have followed Veronica's story since the beginning. There were a few moments when the interactions between characters felt strange to me, especially between Logan/Weevil and Veronica/Leo, but those were few and far between. Most of the time, it feels like coming back to a familiar place and spending time with characters you have loved for a long time. I'm so jealous! This book is at the top of my "I want to read it now!" list. :) But it's not available at my library yet. 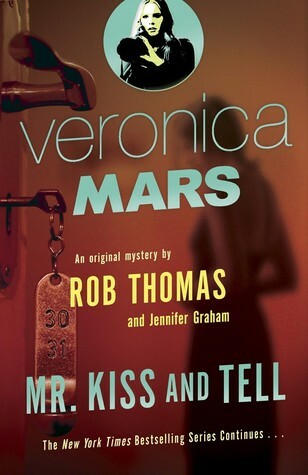 I'm so glad that this mystery is even better than the first Veronica Mars novel. It gives me something to look forward to. Great review! Boo! Your library needs to get it pronto!! Great review! I also enjoyed the mystery in this book better than the first, but I really liked both books. They are a great mix of revisiting what I loved about the show but also adding new content. I'm happy to see Veronica's character developing. Exactly! It's a great blend of old familiar and new character development. It's Monday and we are done with being sick!